Allows you to operate the audio system while driving. Roll Up: To increase the volume. Roll Down: To decrease the volume. Push: To mute. Push again to unmute. Move to the right: To select the next preset radio station. Move to the left: To select the previous preset radio station. Move to the right and hold: To select the next strong station. Move to the left and hold: To select the previous strong station. Move to the right: To skip to the next song. Move to the left: To go back to the beginning of the current or previous song. Move to the right and hold: To skip to the next folder. Move to the left and hold: To go back to the previous folder. Move to the right and hold: To select the next station. Move to the left and hold: To select the previous station. The CD mode appears only when a CD is loaded. 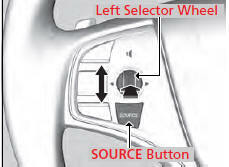 To select audio mode, press the SOURCE button, then move the left selector wheel to the right or left.